The Last Tinker: City of Colors was an absolute mystery to me until I saw the release on Twitter. After grabbing a code and starting into the game, I can say that I was mildly surprised with a game that has been in development for awhile but that I had never heard of. Developed by Mimimi Productions and published by Loot Entertainment, The Last Tinker is a game whose charm catches you right away and though it screws up from time to time, manages to keep you entertained for the entire journey. In this City of Colors, you play as Koru, a young monkey boy living in the Outer District, a place where colors can live freely. Koru finds out he is a tinker and is now on a mission to travel throughout the worlds of Red, Green, and Blue to unite to colors and free everyone from the bleakness that has swept through the land. With your good friend Tap along for the ride, Koru must gather the powers of each district and defeat the purple spirit who has started to turn the world white. The story is a unique twist on the world’s tension between people from different backgrounds or locations, or at least that is how I saw it. Told through funny sounding text dialogue boxes, similar to LittleBigPlanet or Doki-Doki Universe, The Last Tinker has a refreshing story and funny set of characters that make the world very enjoyable. The Last Tinker is a platformer with combat and puzzle solving elements that doesn’t fail in anything it does but doesn’t really stand out with anything either. The platforming feels somewhat on rails as you hold down the run button and run in a direction, automatically jumping from platform to platform with no real challenge and no real fear of missing and falling down. Again, it’s not a terrible system and it is functional, but it doesn’t really do anything special. The platforming gets a little varied as you get later into the game, where have to do things like slow down time to make it across water before boxes sink. It does improve the system a bit, but you have to wait until around seven hours in to really see it open up more. The game also features an on-rails platforming in a few levels that plays almost exactly like something from Ratchet & Clank, where you are jumping from rail to rail to avoid objects. These on rails sections are fast and fun but come with a huge issue of camera angles that make some of the parts extremely frustrating. Combat is much like the platforming, in that it functions well but is overly easy and doesn’t do much to stand out. It basically boils down to spamming a face button and dodging at the correct time to avoid damage. Where is opens up a bit is with the spirits. After you collect a spirit from each district, you will then be able to use their powers. Each one allows you to shoot enemies from afar, but the different powers cause different reactions in your enemies. Shooting them with the Green power causes them to flee or the Blue power freezes them in place. It actually adds a lot to the combat but you won’t even unlock your last power until at least 7-8 hours into the game and only have your full compliment for about two levels. As you attack enemies you fill up a special meter that once full, allows you to perform a special attack like slowing down time with green or going into a rage with red. I rarely ever needed to use these in battles, only instead using blue and green powers during puzzle solving. The puzzle solving is probably the hardest part of the three game play types and that is not saying much because it isn’t overly difficult at all. In fact, most of the puzzles can be solved very easily. Where things get really cool is with the mushroom men throughout the world. These guys can be dragged along with you by whistling and then used to stomp on buttons to lower bridges or shrunk to become a bomb that blows up walls. Each mushroom also reacts differently to the color powers, as using green can allow you to jump on it’s back and red makes them jump or explode. Outside of using these guys and the occasional power late in the game, puzzles are fairly bland and easy to figure out. Throughout each area of the game you will also be able to find gold paint brushes hidden around. Collecting these brushes opens up concept art to view as well as funny game modes to activate. These modes range from big or small heads, to making the world completely black and white. None of these options affect the game play, but it is always fun to turn on big heads and see just how awkward your characters look. You can also collect loot throughout each level by destroying creates or defeating enemies. This loot can then be used to purchase new combat moves or enhance your spirit powers. However, outside of increasing your health bar or the amount of time your power lasts, there really isn’t much there worth getting. The moves you can unlock, like the jumping moving, are so awkward to use in battle and do absolutely no real damage to enemies, making them a moot point to purchase other than to get a trophy for buying every move. The world of The Last Tinker is extremely vibrant, with each district full of color after you take out the bleakness. It is a very beautiful world that does a good job of looking visually appealing without having top notch graphics. In fact, the game looks more like a late generation PlayStation 3 game than a PS4 title, but that isn’t necessarily a bad thing. The game did feature some technical hiccups, as a few times during combat I would dive out of the way of an attack and get stuck on some invisible ledge that I couldn’t get out of out, having to resort to jumping in the water to kill myself. Luckily, you have unlimited continues so dying isn’t that big of a deal. There was also a lot of slow down when you would finish an on-rails platforming section or sometimes when you would get into combat. For a game that I knew nothing about until maybe a few days before release, The Last Tinker: City of Colors really did surprise and impress me, even with some of it’s hiccups. What you have is a colorful and vibrant world full of cute inhabitants, quirky moments, and a great done soundtrack that do enough to keep you interested. This is the perfect example of a game that you could called a jack of all trades but a master of none. The combat, platforming, and puzzle solving are all serviceable game play elements that function well without being spectacular. Each section is just good enough. With over 10+ hours of game play, it is longer than I expected but has almost zero replay value to speak of. 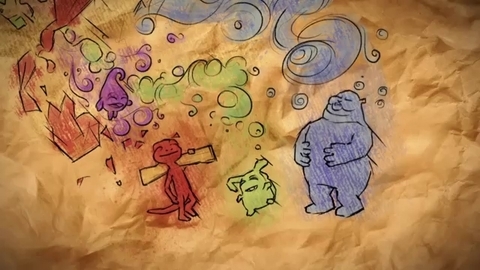 The Last Tinker: City of Colors is a throw back game that provides gamers with a simple approach to fun and it works. The Lat Tinker: City of Colors review copy provided by publisher. For information on scoring, please read our Review Policy here. Hey look, a world that isn't a dull gray!